You’ve just created a beautiful new website and you’ve made the domain live only to find, well… that you can’t be found! Suddenly the realisation dawns on you that your website is useless if it can’t be found when people search for it. What can you do to start ranking? Check out this simple guide to SEO and learn some of things you can do to get onto the first page of Google’s results. If you’re using a WordPress site, you may have set your website to ‘discourage search engines from indexing your site’ whilst it was in development. This is an actual setting in the WordPress Dashboard that can be found here: Settings > Reading. Make sure the box is unchecked so that your site can be crawled by search engines. 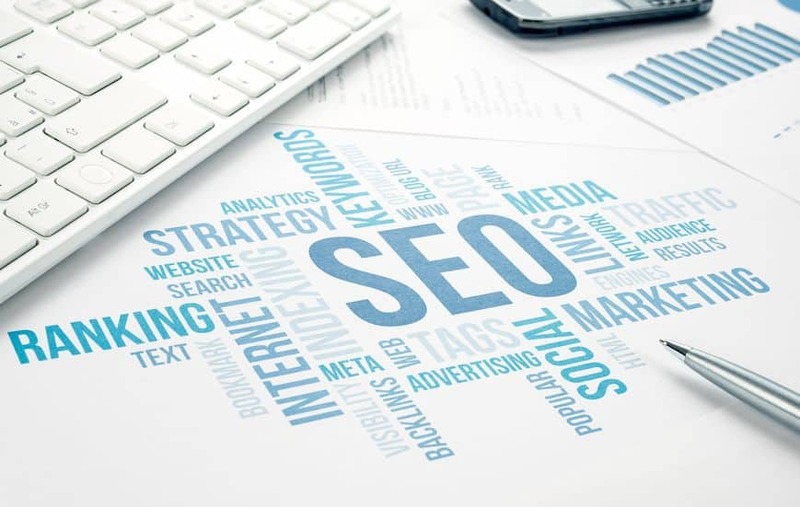 On-Site SEO refers to things you do with your website’s content to make it more search engine friendly and influence rank. It means inserting relevant keyword phrases (that you’ve researched) into things like page titles, headings, body text, image alt tags, and links. You can also improve your site’s SEO by linking relevant pages together. This is the kind of SEO work that most people can get involved with without hiring a professional, but it still requires a bit of knowledge to do it right, so it’s worth doing some research. More on this in a bit. Off-Site SEO is where you place links to your website on other external websites. This is often an abused practice in SEO, and if done incorrectly, it can have a negative impact on your website’s rank, so if you’re going to do this, it really helps to know what you’re doing. Typically, most people employ an SEO specialist to do off-site SEO. If you’re going to try this yourself, you’ll need to insert links on related websites and avoid spammy activities like link swapping with irrelevant websites. If you can persuade other blog owners, or similar established and respectable websites in your field to link to you, this can be a good way to improve your own domain’s authority. Google will eventually get round to indexing your website, but it can take anywhere from a week to over a month to do this (it’s quite a busy search engine, you see). So, why not speed the process up by submitting your site directly to Google (and other search engines) yourself? A good way to do this is to use Google Search Console which allows you to submit sitemaps, check if your site is indexed, how many websites link to it, who’s finding it, and if there are any problems with the site that might stop it being found. It also offers suggestions as to how things can be fixed. Visits – how many people are visiting your site in total, as well as new visitors vs returning visitors, over a given period. User behaviour – which pages they enter and leave your site on, and the route they take through it. 5. Use a great tool to help you improve your site’s SEO. WordPress users should check out the Yoast plugin, which does lots of cool things behind the scenes to roll out the red carpet for search engines, but also helps you to easily optimise each page yourself. You simply tell it the target keywords you’d like to optimise each page for and it will analyse your page content and give you advice on what to change. Principal among these things is the meta title and description, which are what shows up in the Google search results pages. Yoast gives you a preview of these and helps you get them just the right length. There are some great help guide videos available through the plugin too. 1 – Keyword research. You need to know how people are looking for sites like yours. What are they typing in? You’ll need some keyword phrases that have sufficient volume of searches to be useful to you without being too competitive. For this, you’ll need a tool. If you have a Google Adwords account, you can use Google’s Keyword planner tool. Other resources are also available – we recommend you check out Moz.com which is a professional SEO resource that you can use for researching keywords and checking out your domain’s authority, as well as the competition’s. 2 – Title and Meta Description. Every page has a title that shows up in the browser tab. It can also have a meta description. The title and description is the text you see on the Google search result pages. The title is a really important place to get your keyword in. The meta description doesn’t affect your rank, but it will affect how many people read and click through to your site – so make it count! 3 – Headings and their structure. Use headings to break up the text in your page and to clearly delineate different sections of content. You should have only H1 heading – that’s the biggest, most important one that describes what the page is about. After that, you may have multiple h2, h3, h4 headings etc, which descend in size and prominence. Headings are great to place your key phrases into. Don’t overdo the same keyword phrase – mix it up a bit and use different variations. 4 – Body text and links. You should write naturally when creating content, but also deliberately to ensure that your content includes variations of your most important keyphrases (yup, you should have a few). Don’t stuff them in, though – that’s spammy. Keep it natural. Links are important, particularly links that link to other pages in your site (internal links), because they tell Google what’s the most important stuff in your site, and help Google’s crawler get around easier. 5 – Image Alt tags. Google can’t see what’s in a web page image, so you need to tell it. The Alt tag is a way of telling the search engine what’s in an image, but it was designed to display a description of the image in the event that it couldn’t be shown for some reason. This was primarily an accessibility attribute, but it is also used by search engines so they know what’s in an image. It’s important to always use Alt tags. Don’t worry so much about the title tag. Describe the image and use keyword phrases where appropriate. Link to your site from all your social media profiles. Get in touch with blog owners in the same niche or field as you and ask for a link. Perhaps ask them to guest blog a post. Get involved in discussions online whether in forums or elsewhere, maybe place a link to your site in your signature, but don’t be spammy. Try and provide useful interaction and be helpful, not a salesperson. If your site is too slow to load, it may get penalised. See our post on optimising your wordpress site for speed. If your site doesn’t responsively adapt to different screen sizes, you may get penalised. If your site isn’t responsive, it may be time to get a new website. Web Browsers like Chrome and Safari are now warning users of sites that aren’t secured by an SSL certificate, which encrypts data as it’s transmitted across the Internet. If your browser is giving warnings like this when you’re looking at your website, you may wish to talk to your web designer or web hosting provider about securing it. Google will be penalising sites that aren’t secure soon, of they’re not already! Google isn’t a fan of duplicate content. As such, you should make sure that you’re not reusing the same content throughout your website. Likewise, you should try to ensure that your site isn’t reproducing content from elsewhere on the web. Not strictly a penalisation, but if your URLs change for any reason, this could affect your page ranking, so always create redirects for page URLs that are changing to avoid broken links from your off-site efforts. Content is still king. That means what is important to Internet users is being able to find quality content. If you have a blog, you can constantly create new content that will be indexed by Google and gives you another piece of content that can attract traffic to your site through search. The more quality content, the better. On the subject of content, as it’s clearly highly important, it works out better for your site’s pages to have something like 600-700 words to stand more chance of ranking higher. So if your site is a bit thin on content, you might want to think about ways in which you can flesh that out a bit. 10. Keep learning and keep going! Don’t just optimise your site once and then call it ‘done’. Things change. Trends change. Your service may change too. Keeping an eye on the competition should help you adapt your site’s content and the keyword phrases that you use. Find some good SEO guides or blogs and read them to improve your knowledge of SEO. We’d recommend Moz’s beginner’s guide to SEO for starters. SEO services can be very expensive, and if you’ve got the time, there’s really no reason why you shouldn’t have a go at it yourself. Sure, there’s a bit of a learning curve here, but it’s not that hard to learn the basics of good practice and make some serious improvements to your website’s SEO. Good luck!